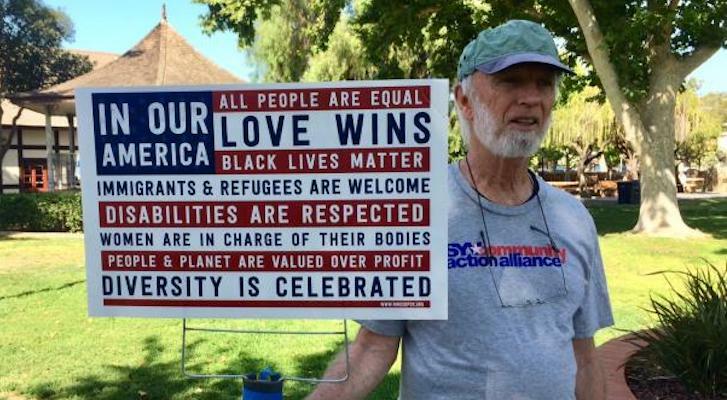 On Saturday 150 Santa Ynez Valley residents and visitors participated in the nationwide "Families Belong Together" march. Wendy Mota from Congressman Carbajal's office and Solvang march organizer Elizabeth Osborne addressed the marchers and onlookers. They decried the inhumanity of separating families and detaining children, and emphasized the need for citizen activism to fight this outrageous treatment of human beings. 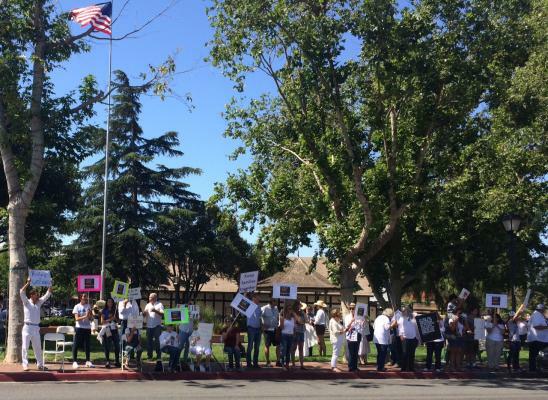 After marching through Solvang, participants lined both sides of Highway 246, chanting and waving signs, and cheering when passing drivers responded by honking their horns or giving a big thumbs up. By mentioning #walkaway, I think you hit the nail on the head. I stumbled across it a few days ago. I made reference to it in a post (now down voted) about the DLG rally, and you mention it here. Because reasonable posts are being down voted tells me that the #walkway movement is going to come as a shock to many. Everyone at this march read the 2008 Human Trafficking act, right? They also read 1997 Flores Settlement and the 2016 9th circuit court of appeals ruling on it, correct? It is against the law to hold families together. Obama's DOJ was sued in 2014 by the ACLU for doing so. As a result, the govt. has two options: separate them, or never arrest the parents to begin with. We should enforce the laws that require parents to be separate from their children when they're arrested. If someone's arrested + prosecuted for grand theft auto, you wouldn't throw their children in a cell w/ that person. You'd put them w/ family members or in some sort of foster care program. The left wing media is lying to these people about the reality of these situations. Why don't you stop posting the same comment in multiple threads? It's always the fault of someone else. Here's your someone else:............ "A Senate rule change championed by outgoing Senate Minority Leader Harry Reid could leave Democrats powerless to stop any of President-elect Donald Trump’s cabinet appointments. In 2013, Sen. Reid and other Democrats pushed forward with a rule change dubbed the “nuclear option” to eliminate filibusters for all presidential nominations except Supreme Court justices. This means that a simple majority of 51 votes instead of 60 votes is necessary to confirm executive office appointments. ".....Does anyone understand what is happening because of this? Anyone? Hello? The democrats created that system, then Mitch McConnell used it. He told them they would regret it; he was right. First, the comment about Harry Reid is a complete change of subject -- typical whataboutism. Second, the nuclear option for Supreme Court justices was executed by Mitch McConnell to install Neil Gorsuch, after he refused to even give Merrick Garland a hearing. Mocking others for blaming someone else and then blaming someone else is the sort of hypocrisy that is the life blood of the right wing.